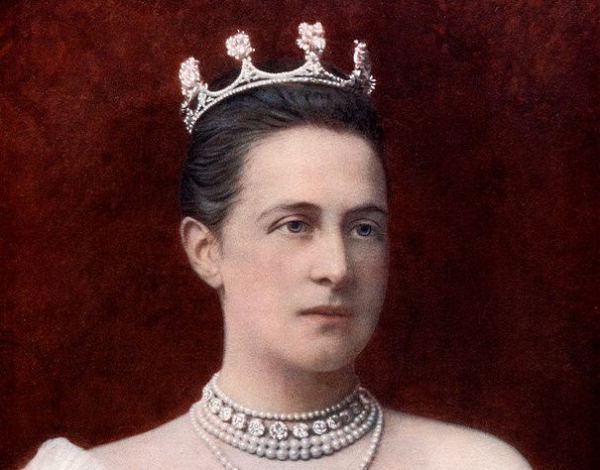 Queen Olga of the Hellenes was both Greece's queen consort and a Russian grand duchess, so you know she had a packed jewelry box. Today we're talking about one of her favorite pieces, her diamond tiara. 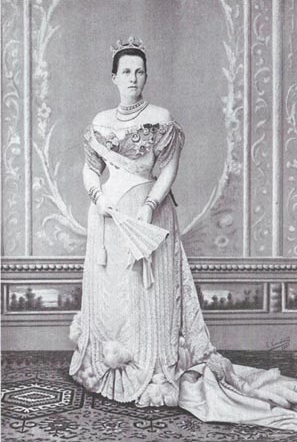 Grand Duchess Olga Constantinovna, a granddaughter of Tsar Nicholas I of Russia, married King George I of the Hellenes in 1867. This tiara features in numerous formal images from her time as Greece's queen, including this court portrait, painted early in her husband's reign. The diadem appears to perhaps have been a coronet, wrapping around the wearer's head. The piece's diamond festoon base features a series of toppers that appear to have been interchangeable. In some images, like this portrait, the tiara appears to be topped by small round pearls. 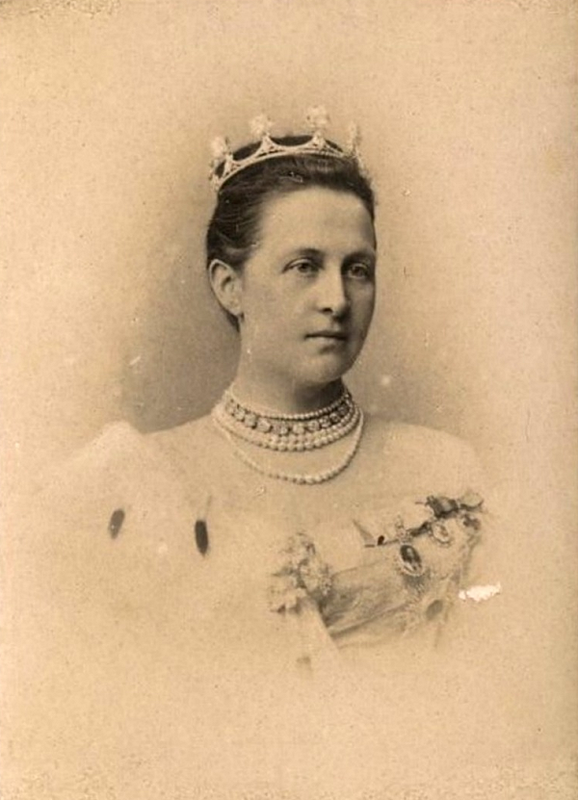 Olga wore the tiara again for this formal photographic portrait, taken later in the nineteenth century. It appears that she often chose a diamond tiara, likely this one, for formal events. A writer for the Ipswich Journal described one of these glittering court functions in Athens in November 1888: "I looked up, and there was the stately form of King George, conspicuous with his orders and blue ribbon. 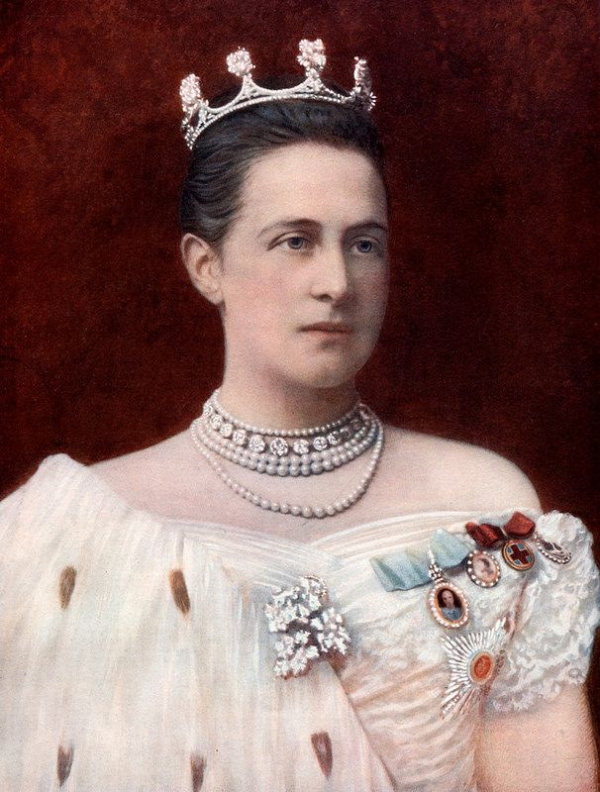 Beside him, on his arm, was Queen Olga, a diamond tiara sparkling on her head." Several images exist from this portrait sitting, including this detailed illustration produced after one of the photographs. Here, the tiara looks like it may have been topped by diamond clusters, perhaps coordinating with the leafy diamond brooch on Olga's gown. Here's the photograph that illustration was based on. Unfortunately, it doesn't give us a clearer view of the tiara's toppers. 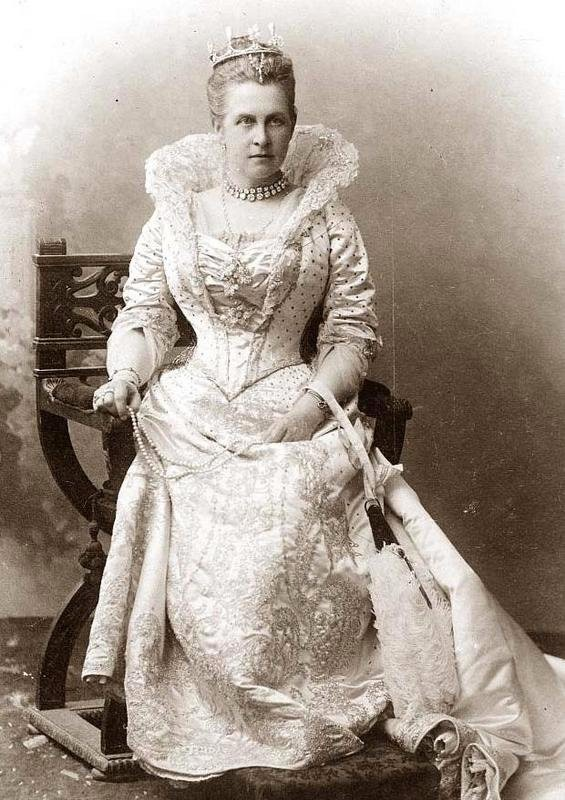 Here, though, we get a good look at the pear-shaped pearls that Olga placed upright on the tiara for a nineteenth-century costume ball. Although it features so prominently in images from her husband's reign, we don't seem to have clear answers about the tiara's fate afterward. We know that Olga left her emeralds to her grandson George, and her rubies to her son Nicholas. (Both sets are now with Constantine and Anne-Marie of Greece.) We also know that the grand diamond and pearl brooch pictured above on Olga's gown was inherited by her second son, George. As some of her jewels were bequeathed together in same-gem groups, maybe the diamond and pearl tiara was left to him as well? 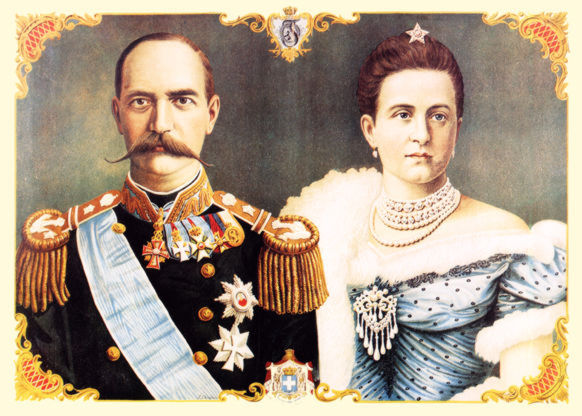 But we also know that Olga was left in a precarious place after her husband's death in 1913, after which the Greek monarchy plunged into turmoil. 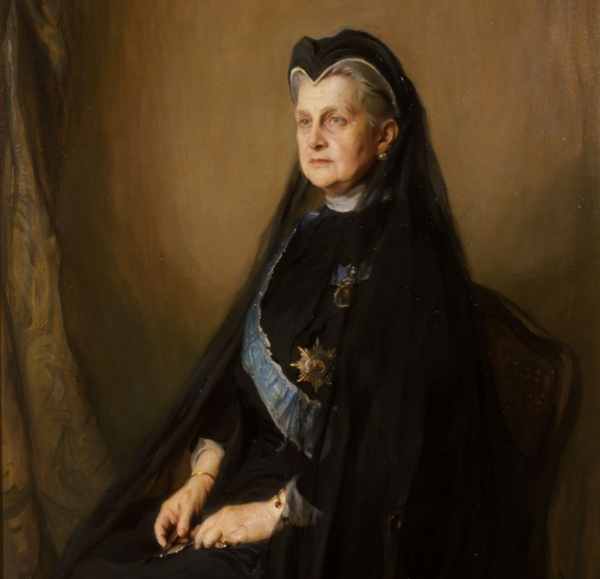 In his book on the history of diplomacy between Britain and Greece, Panagiotis Dimitrakis notes that Olga "asked [King George V] personally to intervene with the British legation in Athens to claim some royal jewels locked in a bank vault there. The final part of the message [from Buckingham Palace to the British ambassador] was rather poignant: 'His Majesty is full of sympathy for Queen Olga who told me that she would have to rely on these jewels for her existence should her allowance be stopped' after the abolition of the monarchy in Greece." 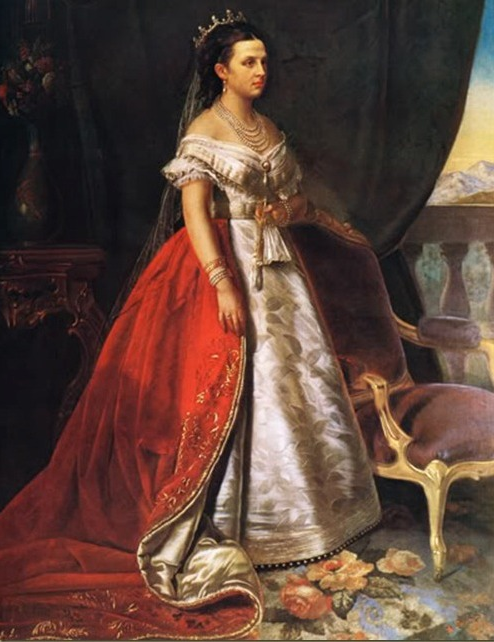 Olga wouldn't have been alone in using her jewels as an insurance policy to survive in exile -- many royals sold their jewels to fund their new non-royal lives. Perhaps this tiara met a similar fate?